The 8-Ball (Pool) Sub Section compete in the Eastern District Pool League (EDPL). The winter competition is the main competition from March to October, however we occasionally enter a summer competition team which is played from October to March. The 8-Ball Section typically has 2 or 3 teams in the winter competition. Team numbers and playing formats vary according to division. Games are played at home & away venues on Tuesday night at 7pm and practice is in on Monday night from 6.30pm. Membership fees for the 8-Ball Section are currently $40 registration with the EDPL at the start of each season and $10 per week playing fee. These fees cover the game, supper on competition nights, shirt, annual presentation function and end of year (winter competition) function. All members of the 8-Ball Section must be financial members of the Sub Branch (Service, Affiliate or Social). New members are welcome. Further information can be obtained by contacting Reception on 9870 6604. The Angling section was formed in the late 1950’s and has always been one of the most popular sporting sections within the R&SL. The section predominately caters for the salt water angler; however there is an annual freshwater trip to the Snowy Mountains. An annual trip to the Snowies or an alternative location, accommodation is arranged and groups of members travel together for this event. The competition lasts for a week and a trophy is awarded for the largest fish caught over this period. One Triples, Three Doubles, Six Singles and One Triples. The Ringwood RSL Golf Sub Section was formed in 1957. 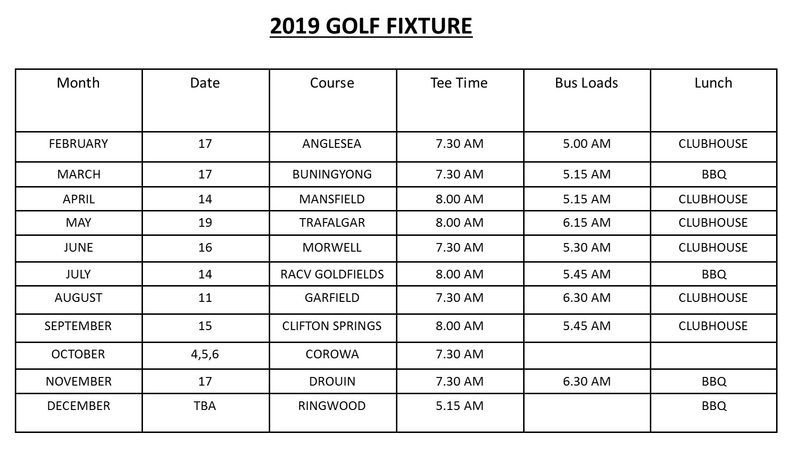 We play monthly at different golf courses, we make ten bus trips, one week-end away and play one game at Ringwood in December. The monthly fee is $55.00, this covers the bus, game, lunch and raffle ticket. The golf section membership fee is $50.00, this covers the annual presentation night in December. Members also need to be a current member of the Ringwood RSL. Golf section meetings are held in the members lounge on the Wednesday prior each game at 8pm.